2019.03_old News, Updates, & Events — Wetland Studies and Solutions, Inc.
Did you read about the Robinson Landing site? "One of the most archaeologically significant sites in Virginia..."
WSSI's Thunderbird Archeology uncovered three more scuttled ships and ±100,000 artifacts, including coins from Ireland, England, France and Spain, along Alexandria's waterfront, just a block away from the ship we unearthed at the Hotel Indigo site. Click here to read the April 13, 2018 Washington Post article. Mike Rolband, PE, PWS, PWD, LEED AP - WSSI's founder and President - has joined George Mason University's Center for Real Estate Entrepreneurship Advisory Board. Click here to read what GMU's School of Business has to say about Mike's contributions to natural and water resources regulatory arena. WSSI provided tree preservation services for Little Bennett Regional Park, and was part of the team awarded the Montgomery County (Maryland) Planning Department’s Design Excellence Program, Open Space and Landscape category in October 2017. The lobby of the new Hotel Indigo features WSSI's Ed Johnson's drawing of the colonial-era ship WSSI discovered there and excavated. WSSI archeologists found these small beads at the Lyndham Hill site in Fairfax County, Virginia. Mark Headly, PWS, PWD, LEED AP (WSSI's Operations Manager) received an "outstanding" rating from his students at the Engineers & Surveyors Institute. Mark has taught a class focused on Waters of the U.S., Chesapeake Bay preservation areas, and permitting for nearly 20 years, over which the regulatory environment has changed significantly. Beads uncovered by WSSI archeologists at a slave dwelling are on display in The Smithsonian National Museum of Natural History's Objects of Wonder exhibit. These petite artifacts were recovered thanks to WSSI's use of best practices (in this case, waterscreening soils through smaller mesh) when standard techniques may not have detected such small items. The Virginia Coastal Policy Center has released The 2016 Stormwater Bill: An Analysis of Perceived and Real Problems with Proposed Solutions. John P. Mullen, Principal Archeologist for Thunderbird Archeology, a division of Wetland Studies and Solutions, Inc. was given the 2016 Outstanding Professional Archeologist award – the Ben Brenman Award – by the City of Alexandria on October 5. John was recognized for his work on the Hotel Indigo project along with Dr. George Schwarz of the Naval History and Heritage Command’s Underwater Archeology Branch and Michael Wilson of Carr City Centers, the developer of the project. 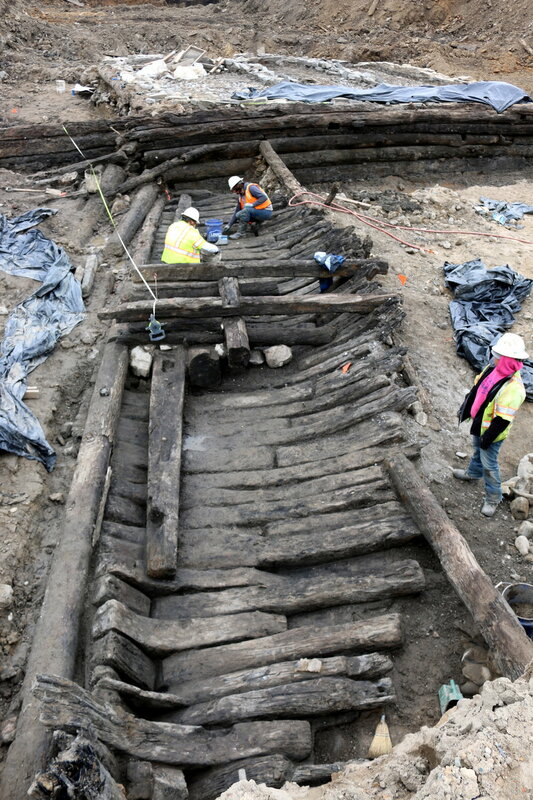 The discovery and excavation of the colonial-era ship in winter 2015-2016 garnered international attention. Click here to learn more about the project. WSSI's Energy Balance article was featured in Stormwater Magazine. The wetlands restoration project at Huntley Meadows Park won an Environmental/ Conservation Award from the National Association of County Park and Recreation Officials (NACPRO). Click here to read more information. The research website for the Huntley Meadows restoration project is up and running. Click here to explore! WSSI has been working with The Peterson Companies and Maryland DNR to restore bass habitat in Smoots Bay. Click here for more information. WSSI was featured as a "Stormwater Champion" in Water Environment Federation's Stormwater Report. Click here! Land and Water Magazine has a feature article on WSSI's Huntley Meadows Restoration. WetBud is the first water budget model that combines the best facets of all known models into a windows-based computer program that is user friendly with an instruction manual. Click here to download the software and then sign up by clicking here.